Finally I´ve managed to finish some sewing. I love the colour combination red and blue and hope to finish a bag today aswell. I´ve been knitting socks for winter and that´s been keeping me away from the sewing machine. 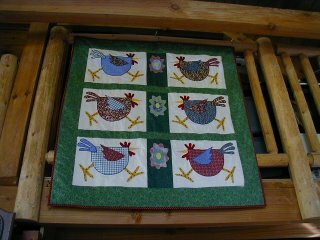 Hi All - everyone;s work looks GREAT - the chicken quilt "cracks" me up! 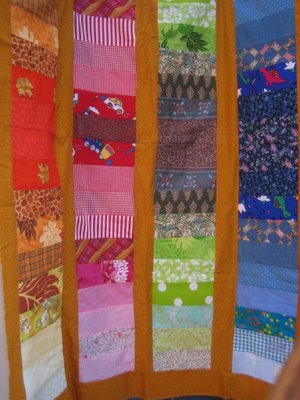 I am travelling soon and wanted to know of everyone's favorite quilt shops/fabric stores between Atlanta, GA and Chattanooga, TN. Thanks for your help - I can't wait to do some major shopping! but here's my contribution to this months theme. I have never really considered myself a quilter. 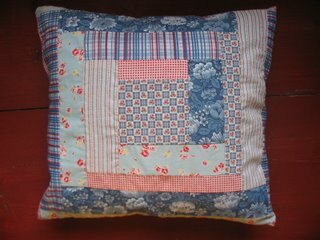 That was until I discovered Japanese craft magazines, I recently purchased this machine quilting book and thought I would try out the log cabin pillow. Being a novice I kept it simple and just did simple 1/2 inch lines. I used cotton batting and it is closed with a tied envelope back. The pillow will be a birthday gift for a friends daugther who is turning 6. I've had a lot of projects on the go lately, but i recently sat down with my vintage hankies and have mapped out the format for the quilt. I also have the fabric i need for the backing, and all i have to do now is set a date with my sewing machine and zoom zoom the hankies together! And, i have solved what to do with the different sizes of hankies - i don't have the heart to cut them to size but i will be added other fabric in between squares. Here is my Sew I Knit Project for August-September. I added ribbon to the back to hang it from the loft railing. 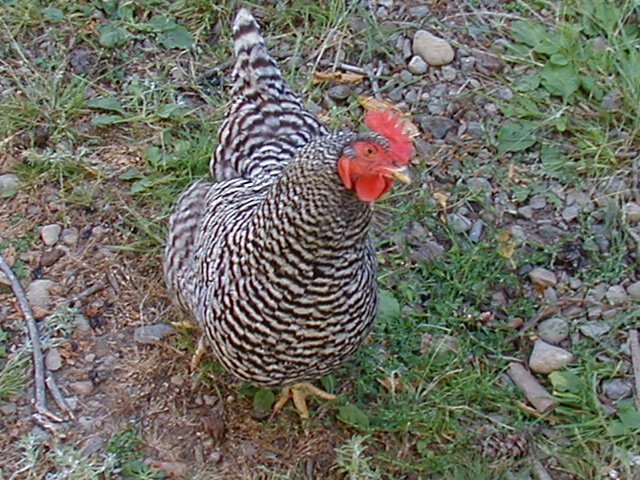 This chicken seems to approve. 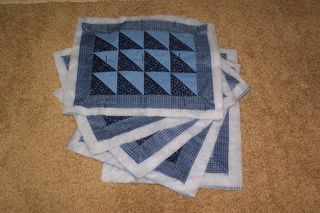 Here is a slightly crooked picture of the quilt I made for this month's quilt project challenge. The fabric choices were inspired by the wildflowers that grow in my yard. The quilt measures about 30 inches by 30 inches. I machine quilted it with my walking foot. I plan to make a sleeve for it and hang it on the wall. It was a lot of fun making it. Now I'd like to make a bigger one for a bed. Woo hoo! 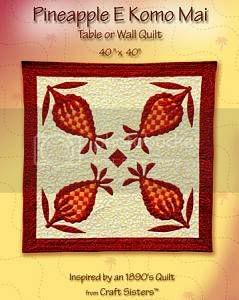 I picked out some fabric last weekend for the Pineapple Quilt. 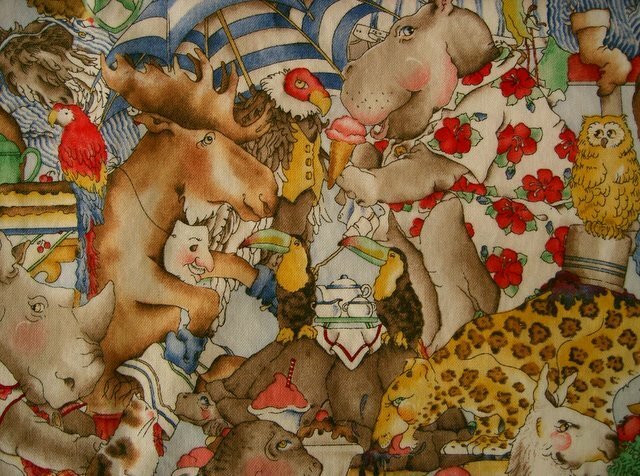 This is a quilt pattern I got when I was in Hawaii. 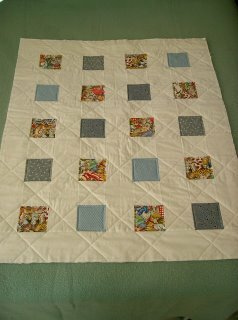 The finished quilt is 40” x 40”, so it is more of a wall quilt or table quilt. I decided to do mine in blues. Here is what I found. The blue squared fabric on top and to the left I plan to use for the center of the pineapples. The little blue flowered fabric I plan to use in the background. Lastly the blue fabric on the bottom I plan to outline the pineapples and also use for the border and the back of the quilt. This is my first time using a pattern for a quilt. I am use to just making it up as I go and just using my imagination, that way when you are finished it is always right because there was no blueprint that you need to compare it too. This will be interesting and a challenge for me to stick to the pattern. I still might tweak it a bit we will see. I am so excited to see everyone’s progress. My name is Jeanine. My apologies for just getting around to posting an introduction. What's worse, is I practically harassed the list moms about joining. I am very excited to have joined the sew?i knit! along. I've been a knitter and crocheter since childhood. I took up sewing as a teen and used to do it quite frequently. I hadn't touched a sewing machine in MANY years. I recently purchased a Janome Jem 660 sewing machine with a five piece quilting kit. 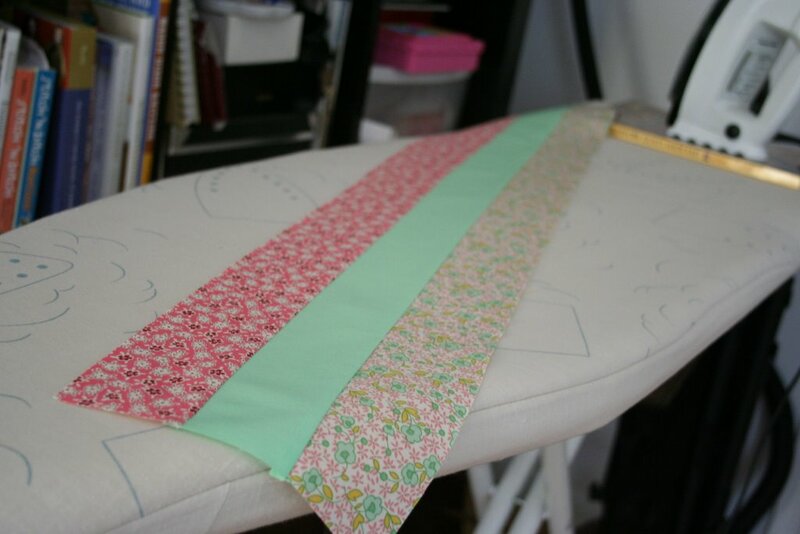 I've done very little sewing with it so far. Why? I haven't fully decided yet. Time is one of the reasons. But as I'm sure you know, you find ways to make the time if you are jonesin for something. I've always wanted to learn to quilt. A friend from my old knitting group actually began to teach me about 2 years ago, but I moved soon after and lost contact with her. For my project, I decided I will be making the Shimmy Shake and Bake Apron from the book Denyse Schmidt's Quilts. I figure the patchwork pocket on the front of the apron would be a great introduction to quilting at least from the patchwork perspective. 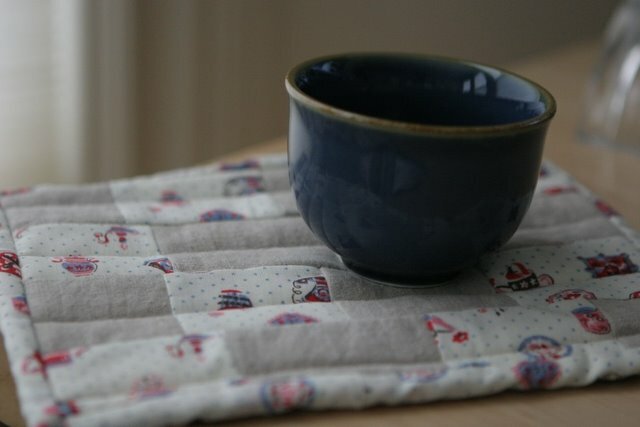 I've also been thinking about making matching pot holders that from the book The Impatient Patchworker. Looking forward to seeing everybody's projects. This is a pretty hectic time for me-I'm moving out of state tomorrow-so I'm not really working on anything for the sewalong this time, but I thought I would share a little about my quilting. Hopefully I will be able to get my machine up and running again soon! I have about 2/3 of the machine quilting left. 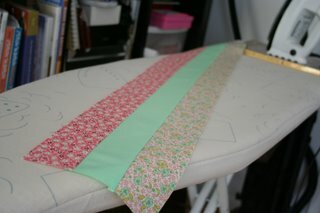 Of course I was quickly dazzled by all kinds of new sewing projects and have not worked on it at all. I love batiks. 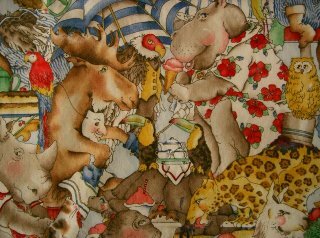 I've just started collecting fabric for a wall quilt from the book Batik Beauties by Laurie Shifrin. It will probably be months before I can actually work on the quilt, but at least I can shop for fabric! 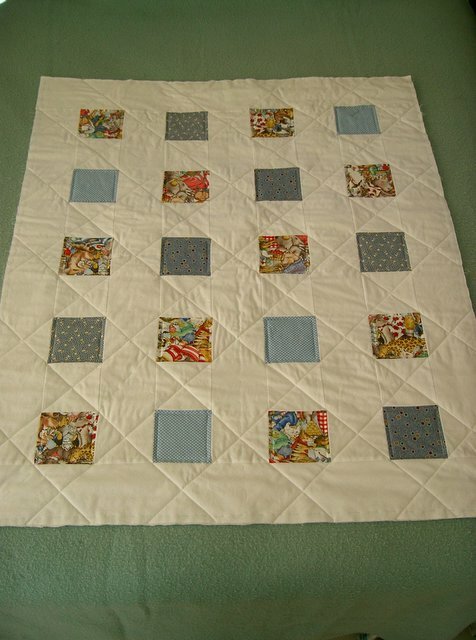 I am making this quilt for a friend's daughter who gave birth to a baby boy in May. I found some sweet quilter's quarters in blue fabrics and a wonderful patterned fabric called "Animal Alphabet" that I used for some of the squares and I will also use for the binding. 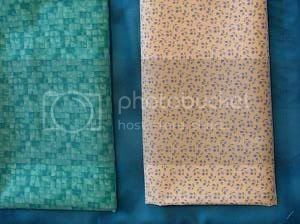 This fabric is in the photo below. 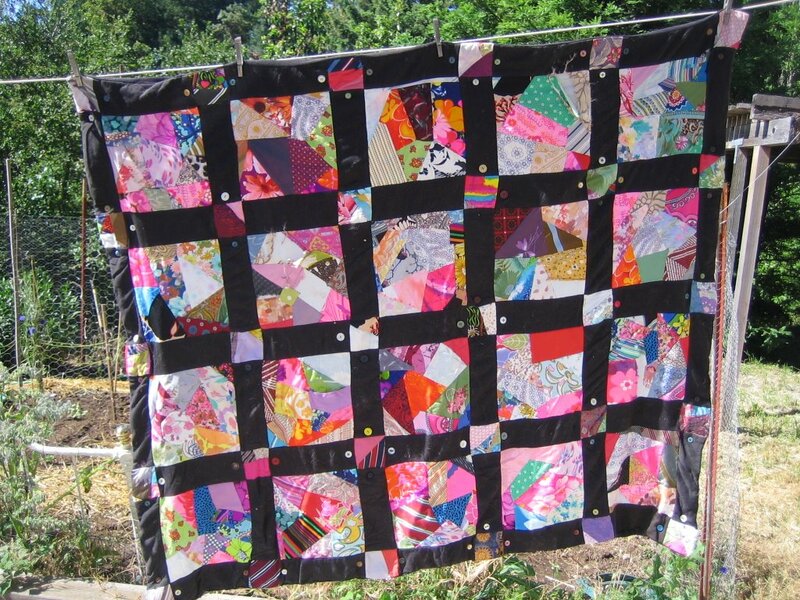 the quilt on the diagonal! I love how it contrasts with the squares and I think it makes them stand out even more. What a great sister, eh? So, I have the binding to do and then I will embroider his name and date of birth on the back. I like the idea of making small quilts. 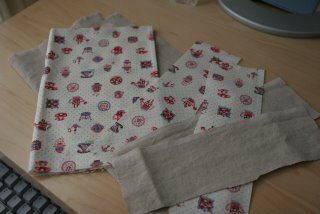 I have two more ready to be cut out and with my new foot, machine quilted! I started this quilt about two months ago. It has been sitting in a pile under the sewing machine since the first burst of inspiration. 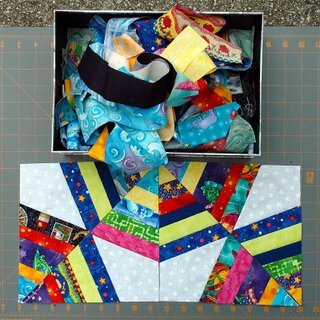 I have named it "box of crayons" since I modeled it roughly on a pattern glimpsed in a book somewhere...now that the preliminary piecing is done, I find it lacking the "umph" it needs to make the project interesting. I'm greasing up my scissors to give it a de - constructed edge. And, as an impetus to actually finishing (besides this blog of course! ), I've entered it in the local county fair. Deadline: September 10th. 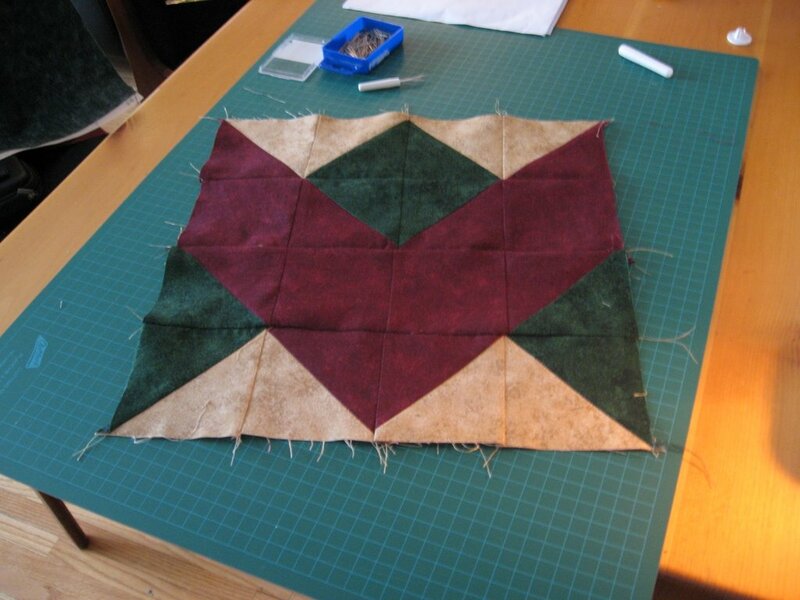 And for further motivation, a glimpse of the past....a quilt I made almost thirteen years ago. You can read about its history here. Hi, everyone. I'm pleased to meet and sew along with you all. Obligatory background information: I'm a soon-to-be 36 year old mom of twin 6 year old boys. We homeschool, so life is crazy-hectic and crazy-fun. I'm a transplanted Yankee living in the south (I'm from Ohio, and hence never knew I was a Yankee until I met my in-laws. Live and learn!) You can also find me at my regular blog, Flyin' Needles. 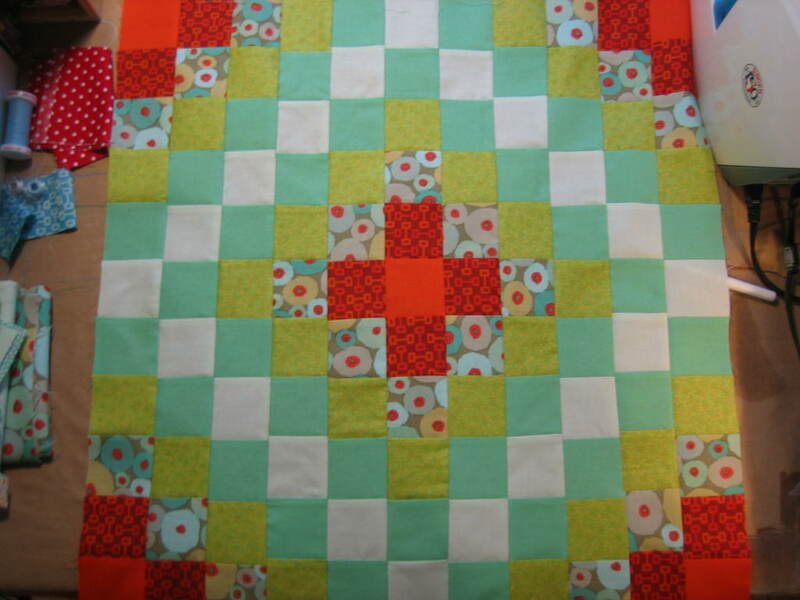 My quilt is a bright little thing destined for a close friend's new baby. 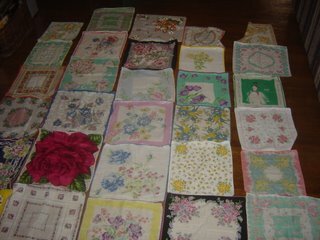 I love the idea of a scrap quilt for this, because I am giving her pieces of my family's past. When I look at the fabric, I see new fabrics bought just for the new baby, fabrics from a picnic quilt she admired, fabrics from my sister's wedding quilt, and ones left over from sewing for my own boys. The pattern is 'Spider Web' from Scrap Quilt - Strips and Spider Webs by Marcia Lasher. I look forward to seeing everyone's projects progress. 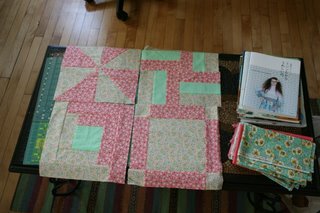 We've had a lovely long weekend here in Canada and I was able to get some sewing done and put a dent in my quilting project. I've completed the first of four blocks I'll be using to create a table runner. The pattern I'm using is called "Ribbons" and was found Here. This first block took me a few hours, but now that I've gotten used to my rotary cutter and have precut all my strips the rest should go much more quickly. Thanks for including me in this current sew-along! 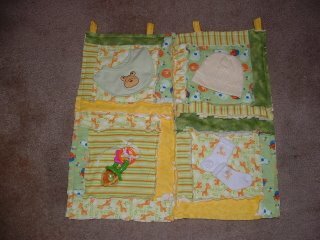 I am new to Sew? I Knit! blog and am really excited about being accepted as a member of such a large and talented group of knitters and sewers. I look forward to sharing my sewing adventures with you. I've recently decided to start sewing again, and I have made a few garments and although they are not perfect, I am getting better and becoming more patient probably due to all the knitting I've done in the last 12 months. So after not finishing one project yet on time ::hanging head in shame::: I will finally finish this one!! Only because my project is in progress and because my baby boy is at that point where he doesn't want to be attatched to me 100% of the time - only 75% ;-). 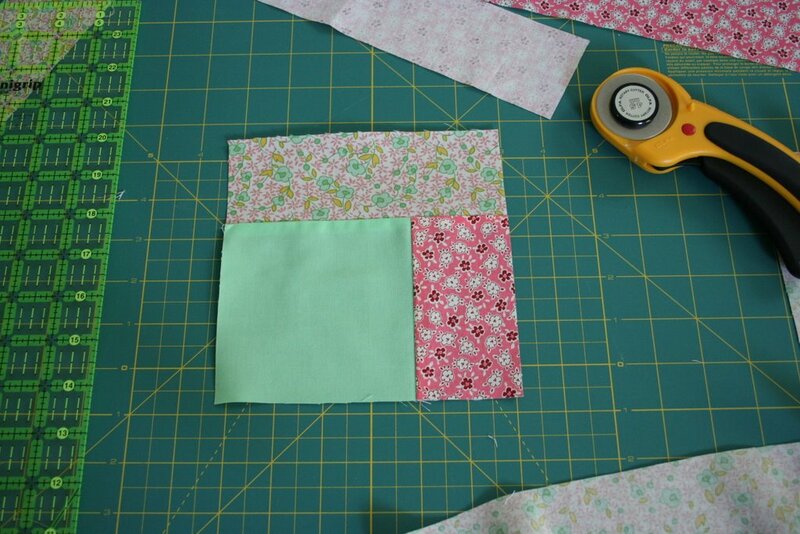 I have to say, I'm excited to see quilting as I started a quilting class at the start of this summer. So this is something I'm working on and learning and having a blast with! They will go to my grannie who only had one request "Use lots and lots of blue!" So I did. It's a set of 6 and I hope to add a few potholders to the mix. We'll see! My name is donna and apart from knitting I do a little bit of everything. I have only made two quilts before, so I consider myself a real beginner. 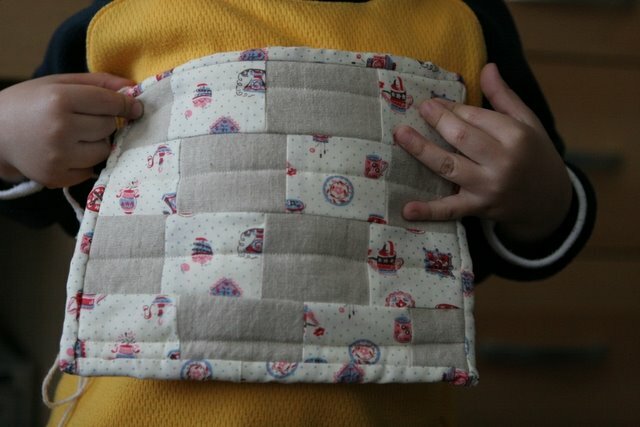 My first one was a made from a full kit (so no fabric decisions) and I got it professionally machine quilted. 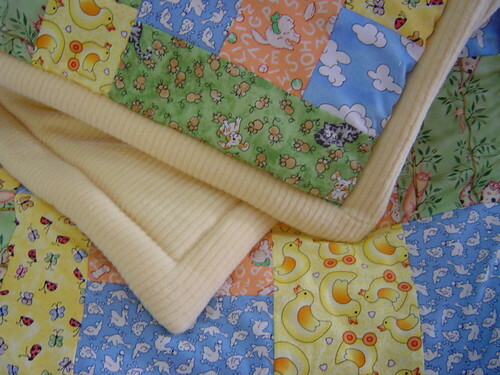 The second was a simple pattern using fat quarters and I used polar fleece for the backing. Not the most ideal for a quilt but great for a baby's play mat, which is its intended use. 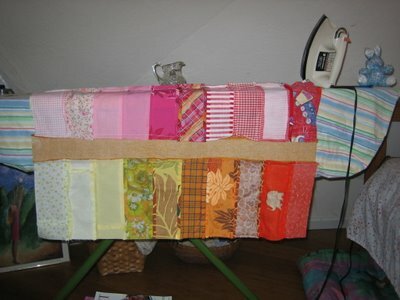 To do something different I am going to make a quilted oven mitt and coordinating apron for this sew-a-long. 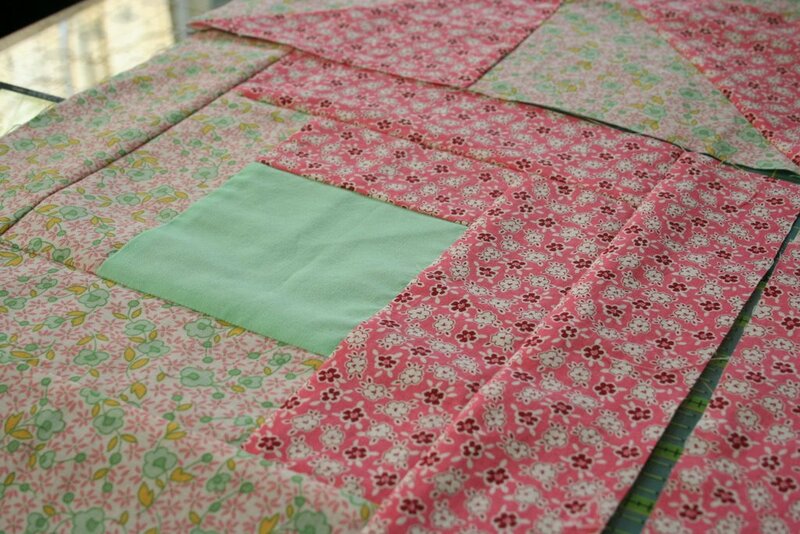 The apron has a quilt block on the front for the pocket. Both of these patterns are from Denyse Schmidts book Quilts.